Leasing Available from $32.06 per month! 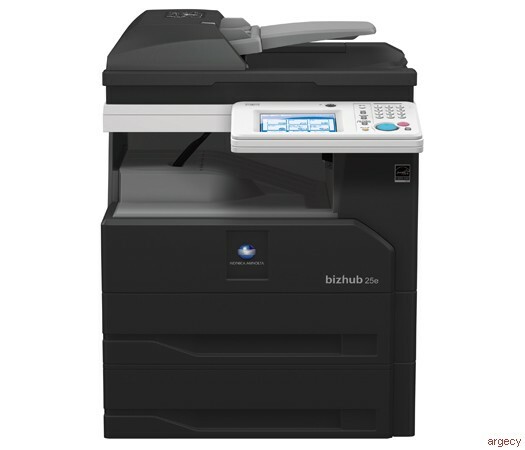 bizhub 25e A business professional that out-performs ordinary all-in-one devices, the bizhub 25e is a real workhorse - combining 25 ppm monochrome print/copy output, fast color scanning with duplexing auto document feeder, standard high-speed fax, 2,100-sheet maximum paper capacity and energy-saving operation to help control your costs. Printable paper size 4" x 6" to 8.5" x 14"
Manual bypass 100 sheets, 4" x 6" to 8.5" x 14"
1st copy out time 5 sec. Original format Max. : Up to 8.5" x 14"
JS-604 External job separator Additional output tray, separation for fax output etc. brand names are trademarks or registered trademarks of their respective companies or organizations. All features and functions described here may not be available on some products.